Oh, the many masks I've worn.....this challenge was a subtle reminder. Its made me reflect on when and why one chooses to be something they're not....completely. Whether it is to be brave and confident in the face of fear and doubt, or to hide the personal and private, masks can protect us. Masks can allow us to put our best foot forward.....or create a person we'd like to be. And the more I thought, the more I thought masks and masking were incredibly complex. 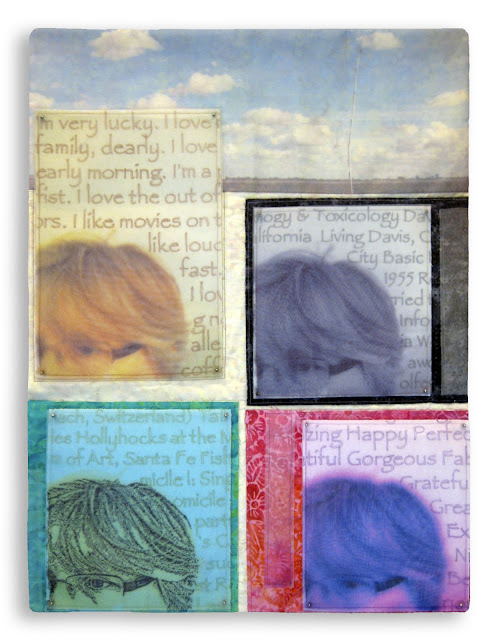 "facemask" was created from photos and text collected and assembled from my Facebook page. 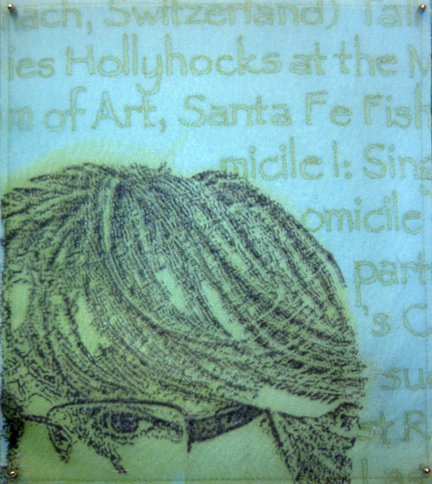 Images were printed on silk organza using digital ground and ink-jet printing. Text was machine quilted and a second image was overlaid to create dimension and masks on masks. I really like your take on this, Martha. There are so many masks or personas we use throughout the day, depending on the situation we're in. This is especially true on the internet where identities are formed from single sentences and brief glimpses. Love your spy-cam-capture profile picture, too! Thanks, Kate! This was a thought-provoking challenge for me, the more I thought about it, the more intriguing it became. Sadly, I think my best ideas came to me as I was finishing the second version of this piece......but that will have to wait for another day. Thanks for posing such an interesting challenge.